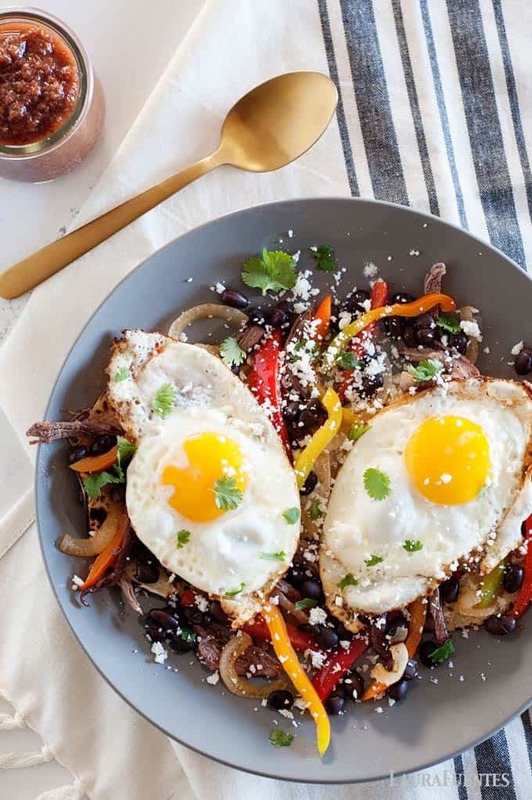 Classic steak and eggs breakfast served inside a taco… this just might be the best breakfast-for-dinner recipe yet! Move over bacon and eggs! 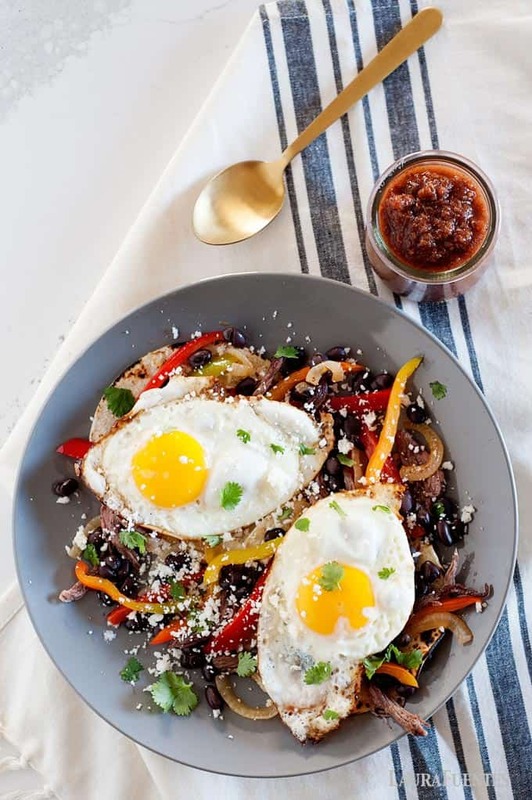 While we all love that traditional breakfast, this Steak & Eggs Breakfast Taco is going to be your new favorite. If you’ve never had the classic diner breakfast of steak and eggs, this taco is a great place to start. Tender steak, veggies, with perfectly cooked eggs and cheese, man oh man, these are the best. What am I saying?! The entire Taco Tuesday Cookbook is incredible! 52 LEGIT taco recipes plus all the essentials like salsa, pico de gallo, chimichurri, need I say more? Breakfast tacos have always been a favorite of mine. Which you’ve probably picked up on if you’ve been around for my other Taco Tuesday recipes or been watching along on my youtube channel. 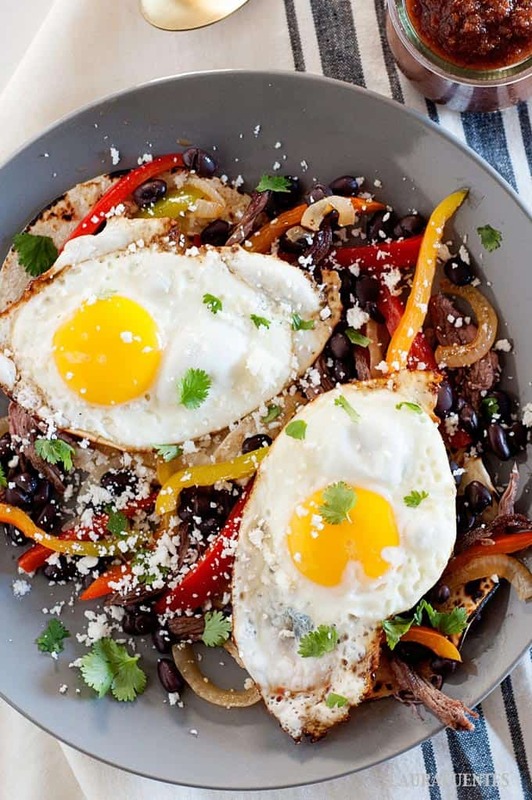 Today’s Steak & Egg breakfast is the perfect addition to the list. 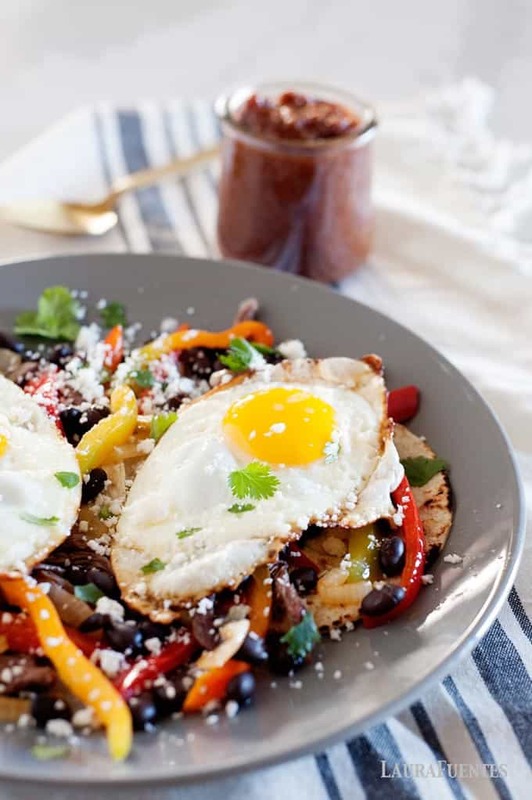 When thinking about breakfast or egg taco recipes, the biggest question is, what kind of eggs to use. Today’s recipe can be made with traditional scrambled eggs, or sunny side up fried eggs like I’ve shown in the photos here. 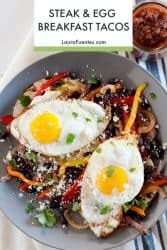 I’m a total sucker for a delicious runny egg yolk, so I usually cook my eggs for this recipe over easy. But if your family isn’t a fan of over-easy yolk, make them scrambled and you won’t go wrong. 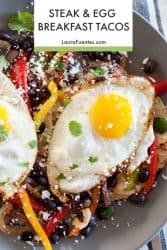 If steak and eggs aren’t something you cook for breakfast -even on the weekends- I’m here to tell you that this steak and egg recipe is for taco night! To make this recipe super fast on a Tuesday, I chose thinly sliced deli roast beef. HOWEVER, if you’re not into that, use leftover pot roast, skirt steak, flank finely sliced, the results- nothing short of AMAZING. To stretch the steak even further I add fajita vegetables and black beans… because more veggies and less meat is always a good idea -both for the waistline and for the budget. These tacos are hearty and filling so they can keep you going all day or fill you up at the end of a busy day. The recipe and many other delicious Taco Recipes are inside The Taco Tuesday Cookbook. So make sure to grab a copy and cook along every week on my youtube channel. I share a brand new taco video every single Tuesday!